I am so excited about the bellydance show I’m going to be in on Saturday! Someday I would love to learn how to bellydance, but for now, I’ll settle for helping to provide the music. 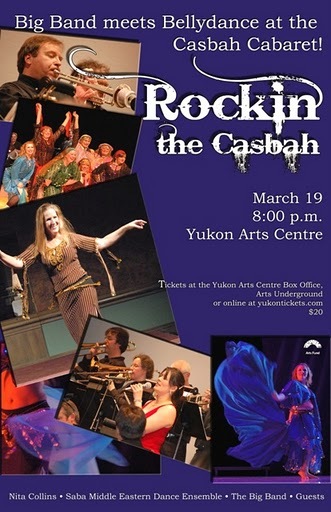 Nita Collins, who is the teacher of Celebrations Bellydance school and the leader of the Saba Middle Eastern Dance Ensemble, also happens to be the Big Band’s bari sax player. For this show, she decided to combine her love of Big Band music with her love of dance. I don’t have enough superlative adjectives to say how much fun the fusion is! On top of playing piano with the Big Band for about half the dances in the show, I’ll be singing two songs. I’d love to tell you what they are, but that’s top-secret. I will say that they’re both beautiful tunes I adore, and I can’t wait to sing them. Thank goodness I got the flu early enough to recover from it, right? I hope you had the best time! I used to take bellydancing lessons! It’s really hard, lol. No matter how much my heart wanted to be really good at it, I could never get the hang of it. So much fun, though.